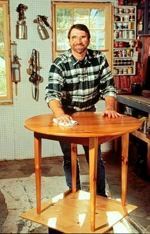 With this table project, Norm found inspiration in an antique shop on the island of Nantucket that features old Irish country style furniture. The table features tapered legs and a 36 inch round top. Norm built his using recycled pine and his methods of construction include mortise and tenon joinery. The plan also shows how to build your own tapering jig for the table saw. The New Yankee Workshop® on PBS is a co-production of Morash Associates, Inc. and WGBH Boston. ©Morash Assoc., Inc., WGBH Educational Foundation and Linnor Inc. All Rights Reserved.